What does any part of this scheme have to do with educating your adult children? Why should you pay for Mount SAC's delusions of grandeur? You'll pay not only with your taxes, but also with the damage to your quality of life. Mount SAC officials don't care a wit about your community. It has demonstrated over and over that it will spend your taxes to get what it wants, no matter what the cost. Mount SAC is putting another huge bond on the ballot in November 2018. Will it be $500 million or will it be $1 BILLION? The decision will come down to whether it gets its way to drive pollution and congestion to the corner of Temple/Amar and Grand and every other intersection within a 10 mile radius. The Olympic Trials are just the beginning. It's got its eye on it being a venue for the 2024 or 2028 Olympic Games at Los Angeles. Read the article. Notice the hubris of those quoted. It's a community college for God's sake. The megalomaniacs that run it, however, have their on eyes on world-wide attention, to bring in thousands of paying international students. Can you think of a single local business that won't be negatively affected by swamping the area with traffic from out-of-towners and the publicity and entertainment entourage that will come with them? This looks suspiciously like a cut and paste from a Mount SAC press release doesn't it? Armijo's company has been promoting this for months, giving it two, identical, front-page articles with the same story over and over. Our Weekly News is never delivered to your driveway (or gutter) unless it's getting paid to do it. Was Armijo paid to write it? Who paid for the August 24 issue delivery? Walnut - On December 13, 2017 there will be a Walnut City Council meeting and the final vote to have the support of the City of Walnut for the Olympic Trials will be on the agenda. "We are starting to move the dirt for the construction needed to have the trials because if we don't start we will have to tell the powers that be we can't have the trials," said Doug Todd." "We are going to begin and move forward with the confidence that the Council will vote for the Trials or until we get a stop work order from them". Olympics from page 1 new incoming stadium was chosen for the 2020 U.S. Olympic Track and Field Trials, a move that could potentially bring in over $40 million in revenue for the area CriticalHe's just making up a number. What exactly is the "area?" Notice the difference between the headline's "local communities." Unlike Eugene Oregon, Walnut is a bedroom community and has no hotels or airports or transportation system. Nobody's going to use Metrolink to get here. .
"The Olympic Trials in Eugene Oregon has historically brought in around $38 million dollars to their local economy for the 9 day period that the trials were held during 2012," said Doug Todd, Director of Track and Cross Country for Mt. Sac. "We haven't seen the projections for 2016 as of yet, but it should top over $40 million." Todd also noted that the national and international attention this event will bring to the city of Walnut and immediate surrounding cities, the San Gabriel Valley, the Inland Empire, and even the Los Angeles cities will benefit as well. "We hope for everyone to get on board and benefit from such a historic event." "As a long time resident of the City of Walnut, I was pleased to hear that Walnut will be hosting the upcoming US Olympic Trials," said Walnut councilman Bob Pacheco. "It's a honor and privilege to be selected. I look forward to working with Mt SAC to assure that the athletes receive a warm welcome so they may enjoy the beauty and resources of our community. "We honored to be chosen over such prestigious institutions," said Mt. Sac Board Member, David Hall in a phone interview Thursday morning. "Our long heritage, very successful trials in past years, the many records set at the college, and the new state of the art facility, are great factors for their choice." The USA Olympic Trials is the National Championship meet that is held every year, but in an Olympic Year, the National Championships become the meet where the US Olympic Committee chooses who will represent the United States in the Olympic Games in Tokyo. It's a wonderful, high stakes competition where the top three make the team and number 4 and below do not. There is no appeal process, no automatic entry process for past performances, and no special dispensation for injury or illness. On a certain day and a certain time in June of 2020 right here at Mt. SAC the best athletes in the country will run, jump or throw for the right to represent us in Tokyo, Japan. It's a real testimony to competition bringing out the best and, sadly, sometimes the worst in people. The selection process wasn't an easy one either. It started with the submission of a preliminary proposal. Five colleges or Organizations did that. After the initial submission the field was narrowed to three "finalists". Mt. SAC, along with the University of Oregon and California State University, Sacramento were each scheduled for a site visit and after the site visit had the opportunity to submit a final proposal. The final step was the opportunity to state our case at USATF's Board of Directors meeting in Sacramento at this year's National Championships. "We were given 15 minutes to summarize our proposal and then to be ready for questions from the board," added Todd. "Before that final presentation we were sent a list of things from our proposal that the board wanted clarification on. We needed to discuss those items within our 15 minute presentation." Mt. Sac's Hilmer Lodge Stadium is no stranger to such an event as the women's Olympic trials were held there in 1968. Twenty world records have been set at Hilmer Lodge Stadium, the annual site for the annual Mt. Sac Relays for the last 60 years. The stadium is under renovations and is scheduled to reopen in 2019 with an expanded seating capacity of 21,000 capacity. The trials, scheduled for Jun 19-28, 2020, will select US track and field delegation for the Tokyo Games. "I'm very proud of the team that helped bring this to fruition, and excited by the challenge" said Todd to OurWeeklyNews.com. "We are excited by the challenge and anxious to finalize the last few details for the organization to get the planning started." Todd is the "meet manager" and Bob Seagrem, a former Olympic Gold Medalist, will be the chairperson of the committee. The last three U.S. Olympic track and field trials were held at Hayward Stadium in Eugene, Ore., the city known as Track Town for its pervasive running culture. The 2000 and 2004 trials were held at Hornet Stadium in Sacramento. Attendance was robust in both cities and both made bids for the 2020 trials. Los Angeles, once the home of many professional track and field meets, hasn't supported the sport at the pro level in recent years, leaving the Mt. SAC Relays the area's most prestigious competition, according to the LA Times. "Our team is cohesive and our historical successes are just many factors Mt. Sac is a great choice for this event," David Hall concluded. "We are looking forward to another successful event." Lots of work and excitement went into the making of this event as an Olympic site, which is for the first time in Southern California since 1984 when the games were held at the Coliseum. The Walnut stadium was chosen in an 11-2 vote by the USA Track and Field's board of directors for the Mt. SAC proposal. Mt. 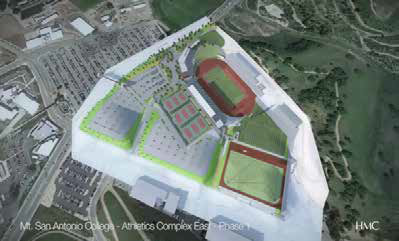 Sac is also rebuilding several areas of Hilmer stadium and the plans are completed and being executed. "I couldn't be happier with the design and the amenities built into the structure. It's going to be wonderful facility, one that will be worthy of the outstanding, world's best athletes that will come here to compete," added Todd. He also noted they are, based on conversations with the people on campus whose job it is to build this stadium, they've had been a few bumps in the road but abelieve that's to be expected in any type of construction project large or small. "You know we have an 'Olympic Caliber' crew of people working on this thing who not only understand every aspect of all that we are attempting to do but who also have an amazing track record, no pun intended, of bringing projects of this scope to completion on time," added Todd. "This entire goal of bringing the trials to Mt. SAC is a very big TEAM effort. Jokingly I've told them a number of times that "if you build it they will come". We've won the bid, the Trials are coming so now we just need to finish the build. I'm confident our team will build it and complete it on time and I'd like to think they are equally confident that once completed we will host one heck off a great event. Everyone across the San Gabriel Valley and the Inland Empire is very much on board and appreciative of Mt. Sac's efforts and the leadership of the city as the build takes place. "Mt SAC is an important economic engine for Southern California. Hosting the 2020 Olympic pre-trials will expose the world to Mt SAC's outstanding amenities and the vast resources it provides within the Greater Los Angeles Area and Southern California," said Carolyn Anderson, long time advocate and Public Sector Solutions Manager for Waste Management Southern California.